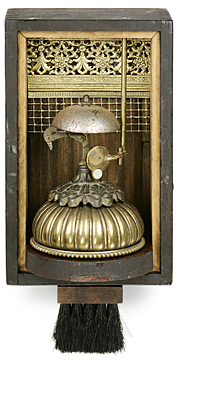 In this small work, a service bell serves as the centerpiece. I had a difficult time trying to integrate so few pieces together. No matter how complex or simple, the trick seems to be to make all the elements talk to each other. To avoid having the parts seem like they were just thrown together. My graphic design background helps, so does my aesthetic. When I do get the pieces to work, the Foundling becomes an integrated whole.